A new generation of clean buses is already saving 55,000 tonnes of greenhouse gas emissions per year and delivering £8 million in health and environmental benefits, according to a new report by the LowCVP for Greener Journeys. There are currently 3,760 certified Low Carbon Emission Buses (LCEBs) currently operating in towns and cities across England, Scotland and Wales, including 40% of new buses sold last year. If this proportion were to reach 100% of all new buses by 2020, the annual savings could increase to 432,000 tonnes of methane, carbon dioxide and nitrous oxide emissions – the equivalent of taking 92,000 cars off the road for a year – and £248.5 million in wider social benefits. 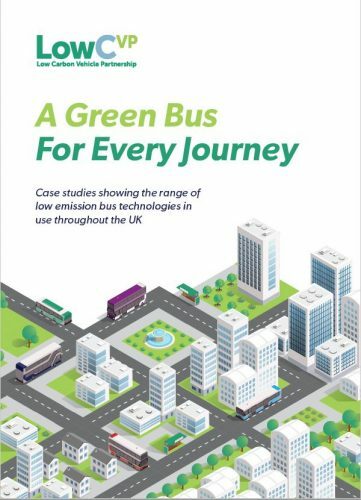 The figures are published in ‘A Green Bus for Every Journey’, a new report by the Low Carbon Vehicle Partnership (LowCVP), commissioned by Greener Journeys, the sustainable travel group, which reveals how the latest buses use a wide range of technologies to help reduce emissions and air pollution. There has also been a dramatic improvement in conventional diesel engines, with the latest Euro 6 models – including over half of all new models bought in 2015 – delivering a 95% reduction in emissions of nitrogen oxides compared with the previous Euro 5 models. The report is launched at today’s e-Bus Summit in London, an event organised to introduce the Horizon 2020 ELIPTIC (“Electrification of Public Transport in Cities”) European project. Greener transport is seen as key to helping towns and cities meet European clean air targets, which are currently being breached in 38 out of 43 UK zones, with many cities introducing clean air zones to help tackle the problem. The drivers of FirstGroup’s 12 electric buses in York say they offer quicker acceleration than conventional models, and passengers prefer them because they offer a smoother ride and are quieter than diesel buses. Claire Haigh, Chief Executive of Greener Journeys, said: “Tackling transport emissions is one of the most pressing issues facing councils and operators today, and this report clearly shows that investing in clean buses is an integral part of the solution. Andy Eastlake, Managing Director of the LowCVP, said: “The UK’s bus sector has made great progress in introducing low emission, efficient technologies over the last decade. This has been in large part due to the support of government and the commitment of industry and other stakeholders to work together and drive change.